While their skin is such a color that it makes them look like porcelain or plastic, these pigs are very much real (although obviously not alive). Quoting from Wikipedia, "fetal pigs are the unborn piglets of sows that were killed by the meat packing industry. These pigs are not bred and killed for this purpose, but are extracted from the deceased sow’s uterus." 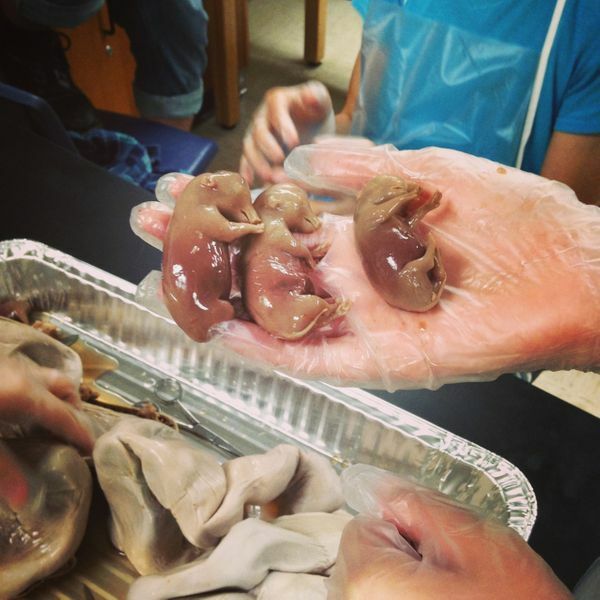 If these pigs are not used for dissections, they are often just thrown away or used in fertilizer, so having students learn from them is definitely preferred. These students did a great job with the dissection; far better than I would have done!